Procent – In mathematics, a percentage is a number or ratio expressed as a fraction of 100. It is often denoted using the percent sign, "%", or the abbreviations "pct. ", "pct"; sometimes the abbreviation "pc" is also used. A percentage is a dimensionless number (pure number). For example, 45% (read as "forty-five percent") is equal to 45⁄100, 45:100, or 0.45. 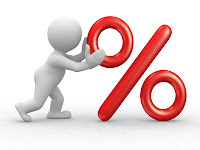 Percentages are often used to express a proportionate part of a total. 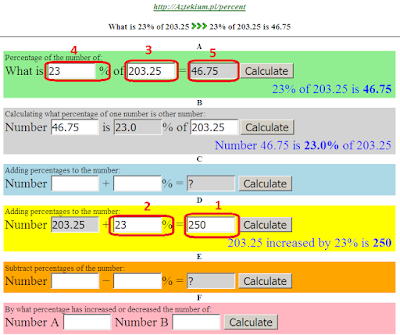 How to calculate percentages in easy and efficient way? It could be a good idea to use a tool which is the colorful percentage calculator which can be found on Aztekium.pl website. Calculating percentages might sound hard but with calculator it is piece of cake and it can be even, pleasant so to speak. The percentage converter on the Aztekium.pl website has labels in which you can put specific values. In gray areas, results are going to appear. Each line (row) is working independently. In order to gain target result you only have to fill white labels in any row. 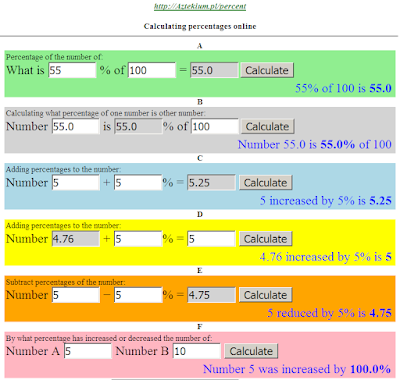 Percentage calculator is a tool which can be found on http://Aztekium.pl website, which is used to calculate percentage. We provide you with a short instruction to the calculator, which can be found below. The first line of the Aztekium calculator is calculating the classic percentage from a target value. An image which can be seen below, shows how does it work. You only have to give number and percentage and the calculator is going to do everything by itself. For example 5% from 200 is 10. Calculating a value, when percentage is given, is an easy task. However, soon we are going to move, to more interesting tasks. In the number and percentage place we have to put a target Excel cells, with given values. The second cell (B) of the calculator is able to give an answer on the question: How to calculate, what percentage value of a number, is a second number. For example we want to calculate what percentage of 200, is 10. The answer is 5%. The whole process is illustrated below. Now we are going to talk about the C field of the percentage converter Aztekium. Summing of percentages with a number is based on adding to the target number, a percentage of thus number. For example I want to add 50% to 100 (it means 50% from 100). The answer will be 150. Addition of percentages in Excel is equally easy. For example if the number is in D3 and the percentage for addition in E3, is enough to insert formula: =(D3+(E3*D3*0,01)). Such formula is going to obviously give 150. If you ask how to subtract percentages, then I can tell you that there are two different types of subtraction. The first one is subtraction of percentages from the value (percentages of this number). For example subtraction of 50% from 100 means that from 100 I subtract (50% from 100) so, 50. Thus, 100-50 = 50. The calculating of this type can be found in E division of Aztekium calculator. The second type of subtraction is much more interesting. It is subtracting already calculated percentage from the number. For example we have a number A and percentage %. We know that a number X was multiplied by this percentage which in result gave A. Though we don't know the value of X. Now we have A and percentage and we have to calculate X. Thus, we want to subtract percentage from A, though not the percentage of A but percentage of X. In other words it is a subtraction from the number, an already added percentage. It can be shown with a question: Number A, is a what value increased by X%? The yellow area is great if you want to calculate from what net sum, the tax was added. We used only yellow and green fields of the Aztekium. We got 46,75 - the value of VAT itself. By adding 203,25 to VAT 46,75 we got 250, our primary value. As it can be seen it is not too hard to calculate. The F field of the calculator is calculating the percentage amount of decrease or increase of the given number. In the A field we put the primary value of the number. In the B field we put the final value. 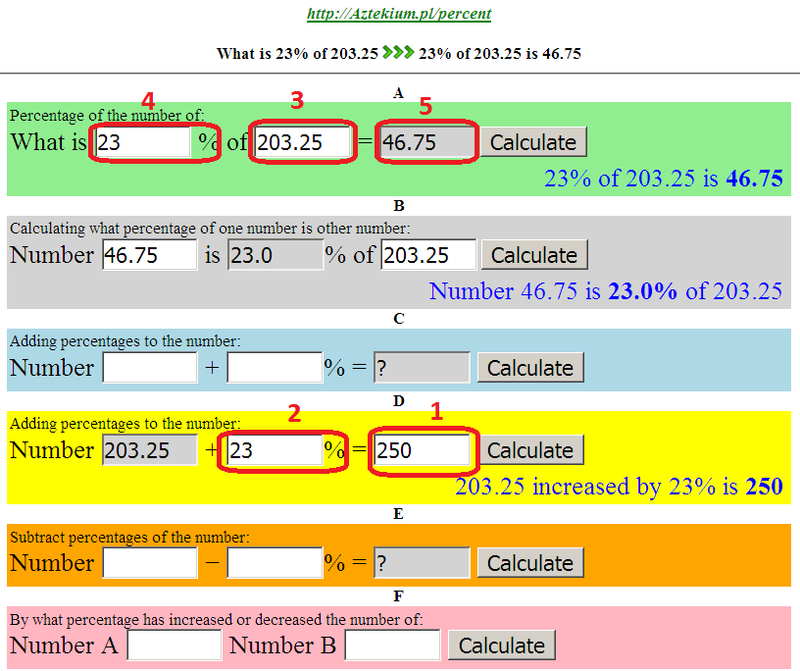 The calculator is able to calculate by what percentage amount the number was increased or decreased. The result is presented in the description of the function. 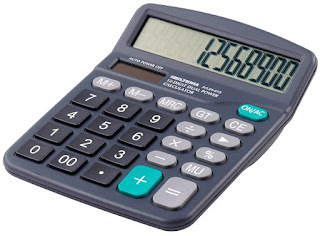 Furthermore the calculator is able to show if the value was decreased. Obviously, it applies to the value which was increased or decreased, which is the A number. The first given number. Here in a few words I am going to describe how to calculate percentages in a normal calculator. How to calculate percentages in a calculator. Calculating with calculator is easy. For example if you want to calculate 47% from 56 you press 47 then % icon and then 56. You get the result. If calculating percentages online is not satisfying enough for you and you want to do it by yourself, then I have a few useful formulas. In order to change a fraction into a percentage you only have to multiply it by 100. Obviously given fraction is going to reflect the percentage of 100. Any fraction can be changed into a percentage by multiplying it by 100%.